← 2nd Workshop Just Added! 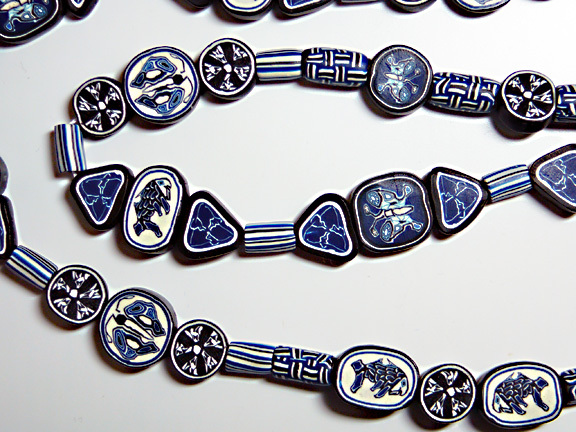 The recent post on Polymer Clay Daily highlighting Joan Taylor’s lovely work in blue and white reminded me of a time when I worked in blue and white (and a little black) for about 6 months. This came about because early in my first year of caning I became frustrated with my multicolored canes looking like mud when they were reduced. Close up view of first necklace. I decided to work in navy blue and white for a while so that I could focus on the designs of the cane without worrying about whether my color combinations would work. Although I used very simple canes, I was pleased with the overall designs. 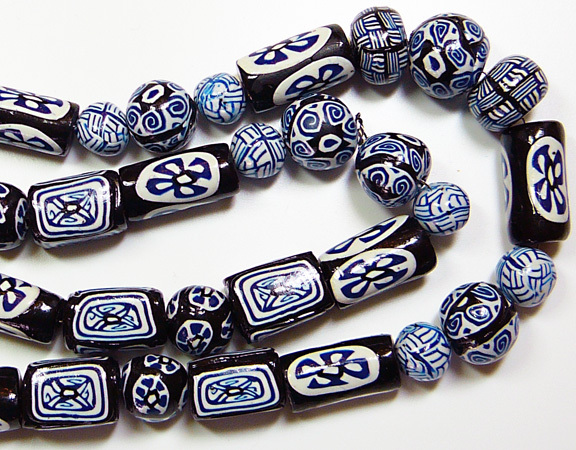 I made beads which I assembled into my first polymer clay necklace. It seems that whatever I do in polymer, I tend to become obsessed with it and do it over and over. I had noticed how Japanese the first one looked and decided to study some Japanese designs and then do another. Close up view of second necklace. This is my second necklace. This time I tried my hand at some animal imagery. I learned how important it was to pack the background clay tightly against the central image. 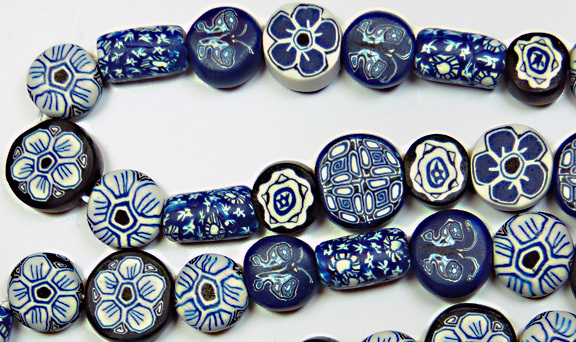 I made a third set of beads with the aim of creating more delicate designs based on a cherry blossom theme. To do this I had to create very narrow lines to delineate the petals. Here is my third necklace. Close up view of third necklace. It is pretty clear that focusing on the cane designs without having to worry about the colors at the same time paid off in giving me better control of my results. If you are feeling frustrated about how your canes are turning out, you might want to give this approach a try. This entry was posted in Caning, Color and tagged Carol Simmons, Color, Color Mixing, Kaleidoscope Canes, polymer clay, Polymer Clay Classes, Polymer Clay Colorado, Polymer Clay Teachers, Polymer Clay Techniques, Polymer Clay Workshops. Bookmark the permalink. Stop the Glop, I love that. I am a big fan of sanded and polished polymer. I agree – it makes a lovely mantra, too. I love the smooth, riverstone finish of polymer that has been sanded and buffed on my jeans, but a highly buffed piece that looks like glass has its attractions too. I’m glad it worked for you too!